A winter yard can be a depressing place, with brown all around and very few signs of life to be seen. But even though you have lost full use of your outdoor space for a time, there are still steps you can take to enjoy your yard and garden throughout the winter months. Resolve to make the most of it by following these tips from Edward Gosman & Associates! Outdoor fireplaces and fire pits make fun winter gathering spots, where friends and family can warm their hands on mugs of hot chocolate, roast marshmallows, and stay snug and toasty by the fire. If you don’t want a fire pit to be a permanent addition to your backyard, there are a variety of fire bowls and portable fire pits available. Hang a bird feeder outside your house and you will have many an enjoyable minute watching winter birds. The bright colors of cardinals and blue jays are particularly lovely against drab winter landscapes. Suet, sunflowers and a variety of other seeds make good winter fare for these birds. Don’t forget to provide water as well; birds are three times more likely to die from a lack of water in the winter than the absence of food. If you’ve never experienced making a snow angel while wearing just your swimsuit, you’re missing out on a fun winter tradition! An outdoor hot tub makes this experience bearable because you can jump right in and warm up when you’re done. Since permanent hot tubs can be pricey, inflatable hot tubs are a good alternative that are less expensive to purchase, run and maintain. Although you don’t need to mow and most plants and flowers are dormant, there are still several tasks that you can complete over the winter. Trees and bushes can be pruned, vines can be cut back, spring and summer perennials can be dug up and divided. If the ground is not frozen, or expected to freeze in the next few days, you can even plant those trees and shrubs you didn’t get around to planting in the fall. Winter is also a great time to start planning what to do with your garden and flowerbeds come spring and summer! 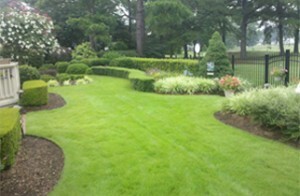 With over 30 years of experience, we at Gosman & Associates are experts in landscape and design. Don’t hesitate to give us a call at (757) 421-2500 when you are ready for some professional help and advice. This entry was posted in Residential Landscaping, Yard Enjoyment on January 25, 2017 by Edward Gosman & Associates.